Since this is the other volume with this ongoing comic series, I knew a greater portion of what to expect. But just as the primary volume did, this volume commenced in a very interesting place after which just meandered combined with the story. I have definitely found out that I like event miniseries more than simply this continuing story. Hopefully this means I’ll love Vader Down, the crossover event using the other ongoing series, Star Wars. This volume commences with Darth Vader for the remains from the Lars homestead, where Luke spent my youth. I really enjoy how Marvel takes characters and places through the movies that didn’t interact and placing them together. Aphra is again a big part in this story. For part with this volume, she seemed a greater portion of a lead character than Vader. Her droids are being received by their own, paving their unique path as not only evil clones of C-3PO and R2-D2. 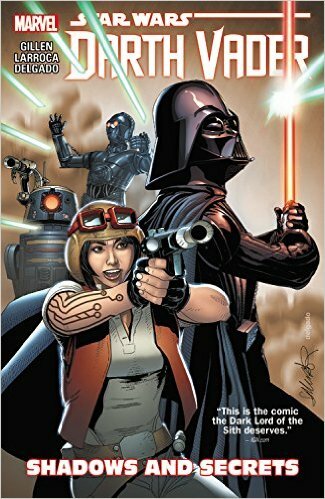 This entry was posted in Comics & Graphic Novels and tagged Star Wars: Darth Vader Vol. 2: Shadows and Secrets (Star Wars (Marvel). This series artfully captures the gap in Annakin Skywalker’s transition from your Clone Wars era ambitious youth for the Imperial era stoic tyrant. We get to find out a side of Darth Vader this is not shown inside the original series, while at the same time never betraying the initial portrayal of the iconic character. The story remains relevant get the job done stakes feel somewhat low as a result of knowing that Darth Vader succeeds within the task he’s set to – Vader frequently comments that entire saga is usually a pointless waste of his time, yet even so unfortunately we cannot feel like the storyplot is boring. The characters which can be introduced are interesting, along with the main supporting cast (while small) keep me intrigued and curious about more, although I don’t normally go for ‘evil’ protagonists.